Whenever we run into friends around the Indiana University campus, the range of greetings usually is pretty narrow. Most of us will say “hello” or “hi,” followed by an inquiry about their health or well-being. But with an international enrollment of more than 6,100 students, it’s not uncommon to hear greetings in other languages. Among Indian students, the traditional greeting is “namaste.” According to one reference, it began as a way to show deep respect, and it is now used as a common greeting in India between strangers and friends of all age and status. However, it’s not quite as simple a gesture to offer an introductory greeting or an expression of appreciation across Africa, as we learned when we asked a group of 25 young leaders from 18 sub-Saharan African nations visiting IU to offer thanks in their own languages. IU’s Bloomington and Indianapolis campuses are hosting these bright young people, between the ages of 25 and 35, who are participating in an academic and leadership development institute. They are here through the U.S. State Department’s Mandela Washington Fellowship for Young African Leaders. Unfortunately, many Americans see the African continent in a singular sense, not appreciating that it is one of the most diverse and multi-cultural places on the planet. IU participants in the Mandela Washington Fellowship for Young African Leaders program, with their hosts at Grazie! Italiano restaurant. 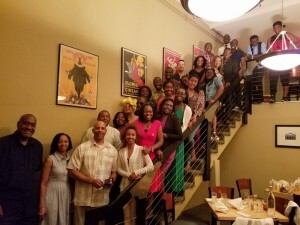 But you’ll appreciate that fact if you watch a simple video that was produced at a gathering of Mandela Washington Fellows with members of the community at a downtown Bloomington restaurant. For example, in Zimbabwe, where Mandela Fellow and women’s rights advocate Karen Mukwasi is from, 28 local languages are spoken. In Cote d’Ivoire, where Mandela Fellow and social activist Landry Guehi is from, people speak 64 local languages. Seventeen languages are commonly spoken in Ethiopia, where Mandela Fellow and pan-Africanist Zemdena Abebe is from. In Tanzania, where Mandela Fellow Janet Manoni is from, the primary language is Swahili, but there also are about 120 tribes which contribute to many dialects being spoken. In Cameroon, where Mandela Fellow Lilian Banmi is from, about 230 languages are spoken. French is the official language of Guinea-Conakry, where Mandala Fellow and ChildFund International finance manager Therese Sagno lives, but more than 24 indigenous languages also are spoken there. Mandela Fellows told us that it’s not uncommon for their parents to understand and speak different dialects or languages. Several shared different expressions of thanks – one from their mother’s tongue and another from their father’s language. As in other places, English is a common means of communications for speakers of different first languages, which I also found to be evident as I’ve gotten to know many of the Mandela Washington Fellows. These young people also are diverse in their professions and occupations. They include a school teacher, medical doctors and public health professionals, a scientist, business people, lawyers, activists, broadcasters and even a hip-hop artist who promotes positive social behavioral change. Other nations represented by the Mandela Fellows include Angola, the Central African Republic, Gabon, Kenya, Madagascar, Malawi, Nigeria, Senegal, South Africa, Sudan, Swaziland and Togo. In case you’re interested in learning a new language, IU’s African Languages Program offers regularly scheduled courses in Akan/Twi, Bamana, Kiswahili, Wolof, Yoruba and Zulu during the academic year. Kiswahili is also taught as an intensive course during the summer sessions. Other languages may be available. Arabic, which is commonly spoken in Sudan, the home of Shohdi Al Hag, another Mandela Fellow and the Sudanese Voices Association founder, is taught through the Near Eastern Languages and Cultures Department. Please take a look at the video and meet some of our latest Indiana Hoosiers.